2010 has been an exciting year for the mining industry. The Australian Super Profits Tax debate came to a climax; the iron ore pricing mechanisms was changed to a system related to the spot market after 40 years of benchmark pricing; the Western Australian Iron Ore Joint Venture between Rio Tinto and BHP Billiton was cancelled; BHP attempted to acquire PotashCorp; 33 Chilean miners were at the center point of global media attention when they were rescued after 68 days underground. Who have been the world’s most influential people in the mining industry this year? The Business of Mining.com gives a top 25. Based on a combination of metrics on ‘Opinion Impact’ (both public opinion and boardroom opinion) and ‘Decision Impact’ (both for 2010 and for the future). The list features a combination of industry leaders, politicians, journalists, advisors and regulators. 24 men; 1 woman. 5 Australians; 4 South Africans; 3 Chinese, 3 Americans; 2 Indians; 2 Canadians; 2 Brits; 1 Guinean; 1 Kazakh; 1 Mongolian; 1 Brazilian. The figure below gives an overview of the 25 most influential people in mining in 2010. Heads the world’s largest mining company. Tried to add potash to the portfolio of the company by (unsuccessfully) offering $39bln for PotashCorp of Saskatchewan. Earlier in the year not only played an active role in the debate about the Australian super profits tax, but also in the attempt to form a Joint Venture for iron ore export from Western Australia. Is furthermore seen as one of the key drivers behind the change of the iron ore pricing scheme. Heads the world’s third largest mining company. Worked with Kloppers on the Pilbara iron ore JV, the new pricing mechanism for iron ore, and the lobbying against the super profits tax as proposed by Kevin Rudd. Used 2010 to restructure the capital structure of his company and to strengthen the ties with Chinese industry and government via various deals with Chinalco. 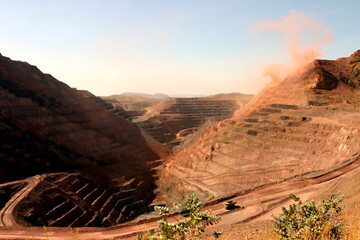 Heads the world’s second largest mining company and largest iron ore producer. Less well-known in the west than Kloppers and Albanese, but certainly a powerful leader in the mining industry. Secured development opportunities in Guinea and in potash production expansions while carefully building relationships with the Brazilian government and the new president: Dilma Rousseff. The man that killed BHP Billiton’s hopes of acquiring PotashCorp by imposing unacceptable conditions in order to secure the deal’s ‘benefit for Canada’. The only women in the list, heading the fourth largest diversified miner in the world. Led the company back to profits after a dramatic 2009. Was appointed chairman of related Anglo Platinum this year and holds directorships of De Beers and BP. Furthermore plays a role in the debates about the future of the industry at the World Economic Forum. Head of the regulating body that was the key obstacle for the Joint Venture between BHP Billiton and Anglo American to export iron ore from Western Australia as the JV would have given the two companies a position that would threaten global competition. Heads the world’s fifth largest diversified mining company, build rapidly by acquisitions under the helm of Davis. Proposed a merger with Anglo American in 2009, and continues to look for expansion options. Plays an important role in the debate around a potential merger of Xstrata with trading house Glencore, the company’s largest stakeholder. The brain behind the Australian super profits tax, designed to skim the ‘excessive profits’ of mining firms. The public debate around the tax was one of the reasons Rudd was not re-elected. Although not in the office anymore, the idea of the super profits tax was implemented by the new government in an adjusted form. Benefited from the drop in popularity of Kevin Rudd to take over the position of Prime Minister of Australia. Did involve the miners in redesigning the law into the Minerals Resource Rent Tax (MRRT), eliminating its major shortcomings. However, the new law, which will become active in 2011, will drastically increase profits for the mining operations in Australia, forcing many mining firms to re-evaluate investments. The man behind the scenes at BHP Billiton. Worked with Kloppers on all major events this year, including the super profits tax, the Pilbara JV, and the PotashCorp offer. Appointed former British Minister Shriti Vadera on the company’s board and prepared the decision to restart high dividend payments to shareholders. John Chadwick deserves the ranking for his magazine. However, he is not the author of I THINK MINING. I, Jack Caldwell, am the perpetual and only writer. No accolades needed or deserved, but accuracy in handing out rewards is to be sought. Thanks for spotting the mistake! Mining was front page news in Australia for much of the year when the Prime Minister, Kevin Rudd, proposed a huge tax on mining profits hot on the heels of high commodity prices and even higher company profits. Not surprisng that Marius Kloppers and Tom Albanese are heading the list. There was much talk also of a young entrepreneur from the robotics sector in WA-Paul Deuchar. Over the medium-term, Australian energy and minerals production is projected to increase by around 29% as I attempt to keep track of mining news from AU. There was much talk also of a young entrepreneur from the robotics sector in WA-Paul Deuchar. Over the medium-term, Australian energy and minerals production is projected to increase by around 29% as I attempt to keep track of mining news from AU. Do you mean Paul Deucher from Argon Technologies?